Today, Aaron Carroll puts some numbers to “sucky” and I’ve added some bloggy value by converting his numbers into a colorful chart. The current McDonald’s policy is the red bar on the right: it costs employees $1,664 per year and offers maximum coverage of $10,000. Now compare that to what a McDonald’s employee can get when ACA kicks in in 2014. At minimum wage, he or she will be eligible for Medicaid and will have to pay nothing. 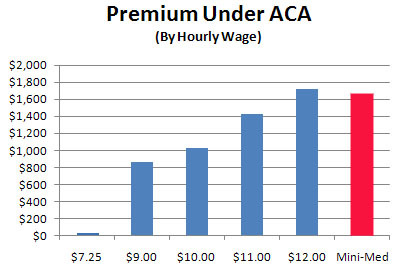 A $9/hour, subsidized private insurance will cost $858. At $10/hour it will cost $1,030. Even at $12/hour — more than virtually anyone makes at McDonald’s — the premium is $1,720, only a dollar a week more than the current mini-med policy. And that’s for real health insurance. Under ACA, the vast majority of McDonald’s workers will get genuine health insurance that’s either free or no more costly than even the laughable micro-med option that offers maximum coverage of $2,000. When 2014 rolls around and McDonald’s does away with both its mini and micro-med policies, that won’t be an unintended consequence of ACA. It will be the whole point. What Does Ross Douthat Really Think?